Young children and infants can't tell parents about vision problems and, in most cases, when a child has an eye problem from birth, he may not know his eyesight could appear differently. Checkups with a pediatrician may not detect subtle eye conditions, so parents should watch for signs such as abnormal eye movements or head positions. If you notice these symptoms in your child, contact an eye doctor for an examination, since early detection and treatment may help improve or protect your child's vision. A child may position his head to compensate for eye misalignment that may occur with conditions such as a "lazy eye." Your child may turn her head or tilt her head back so that she can see something directly in front of her body. If your child has an eyelid condition known as ptosis, in which his upper eyelid droops down over his eyes, he may tilt his head back and look "down" to see beyond his eyelids. Children may also cover one eye or hold objects close to their faces to help them see, which may indicate poor vision or an eye condition such as cataracts that causes vision loss. 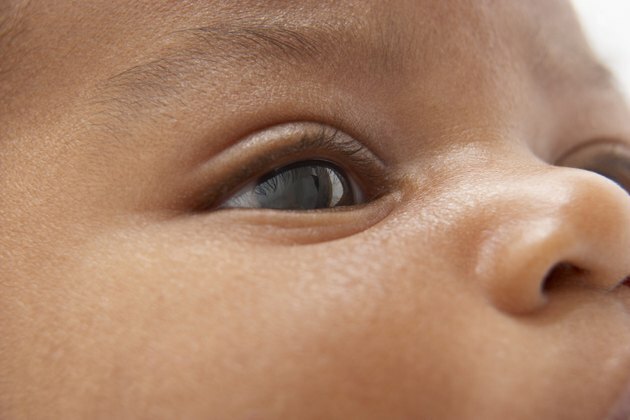 Unusual head movements may also help a child adapt to uncontrolled eye movements. Involuntary eye movements, a condition often referred to as a nystagmus, make the eyes appear to shake or move back and forth, up or down. This condition could stem from eye problems such as eye misalignment or cataracts, but a nystagmus may also appear if your child has vitamin deficiencies or inner ear conditions. An abnormal eye or head movements may also stem from a "tic," a condition common in children. A child with a tic may squint, blink, roll his eyes or move them in abnormal patterns. Head jerking or shaking may also occur. These tics do not typically indicate a serious problem, but may stem from factors such as stress or eye strain. As your child ages, the tics may lessen and could disappear entirely by adulthood. If your child displays abnormal eye or head movements, contact your pediatrician. She will perform an examination and, if necessary, recommend a specialist to evaluate your child further. Eye misalignment or other conditions involving the eye muscles may require patching one eye or a surgical procedure to help correct the condition. Other eye conditions such as congenital cataracts may also require surgery to improve vision and prevent abnormal movements. Eye tics typically don't require treatment, but if your child has worsening tics or displays other symptoms, your doctor may recommend evaluation for Tourette's or other possible causes of the abnormal movements.